I’ve noticed that the ends of my hair are super thick. I try to braid it in two at night, one braid on top and one on the bottom, but it’s impossible for me to braid it to the end. I know that when hair is generally cut pretty blunt, it’s hard to braid it to the end, but I keep wondering if something else is going on with it. I keep examining my hair (and fallen hair) for breakage and I don’t see any. I make sure that I oil my hair well to keep it moisturized, although I think a water base moisturizer would be better at this point. (Any suggestions of a good water based moisturizer?). Maybe this is just how it is at this stage? What could be the cause? I’ve also noticed that my hair feels like a different texture. It’s definitely more wavy than it was when I was younger and it feels like even a different texture than it was before I cut it. I attribute it to the fact that not only does it airdry (which generally makes my hair feel more dry and course than it is, but it airdries out. I don’t have the length to put it in a bunnytail/ponypuff and braid the end of it for it to dry. In addition, it needs to dry in whatever style I plan to have otherwise I’d end up manipulating it too much to get it into the style I want. Which pretty much means that letting it airdry in 4 braids/twists is kind of out of the question. I can always try it again just for good measure though. At the end of the day, it’s definitely still growing… and now I’m not the only one who noticed! Shelli of Hairscapadeswould be proud. I actually have a flower in my hair today! « Rock on with my bad self! It is! It has quickly become my everyday style. I just hope it doesn’t cause any damage. Then again, anything done for too long probably could. Versatility is best. Okay, the flower is cute … but I’m laughing because it’s black, so it’s almost camouflaged by your hair … it’s like a chameleon! LOL! And your waves are gorgeous! But, you are right, to keep wearing it pulled back in the same position day in and day out may put some stress on your hairline. Have you tried to do a French twist? I think your hair looks long enough to do that as an option. It’s a start. Ok, truthfully I was going to wear a white one, but the white one I have is so small, it didn’t look like much of anything when I put it in my hair. As far as styling, I haven’t tried much. I keep thinking my hair is too short for anything, but it’s really not. I’m just starting to realize that. Just found out that I can even do a bun!!!!!! Yeah, you definitely have enough hair to do more than just a TO and pony puff;-). Oh, and I was going to say, having thick ends that you can’t get into twists is a GOOD thing. 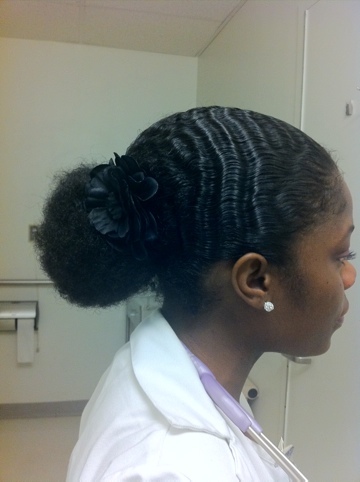 That means that you don’t have breakage or thinning at the ends, which is what tends to make the ends of twists taper! If you feel like they are dry, frizzy or bushy, try the kimmaytube on them. If it is just that the thickness stays the same from the top to the ends, thing of that as a demonstration of how well kept your ends are!